Joey Clams is baaack! 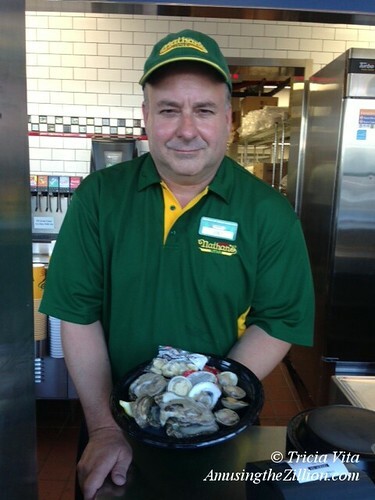 He’s the new chief clam shucker at Nathan’s Famous new clam and oyster bar at Surf and Stillwell in Coney Island. “They call me the mothershucker,” quipped Joey, who started working there this week. Joey was the affable manager of Gyro Corner when it was on the Boardwalk and had a clam bar on the 12th Street side. Its “Hey Joey!” mural painted by L.A.-based Gents of Desire won acclaim from art critics and brought a measure of fame if not fortune to Joey Clams. The mural was painted over when the spot became Nathan’s Boardwalk location, but many photos of “Hey Joey!” can be found on flickr.